It’s mid-January, aka a rather depressing time of year where people are trying to be better by swearing off anything from alcohol to meat, signing up for gym memberships, and attempting to be a more well-rounded person. I personally do not set New Year’s resolutions and rather fall into the mindset of trying to stick to realistic goals for myself 365 days of the year. For example, I do some form of a workout every day and I make sure to change it up so my body won’t get used to it nor will I get bored. I sometimes take an intense strength training class with weights, sometimes I take a more mellow yet challenging PiYo class (pilates and yoga combined), or I’ll take an hour walk in my neighborhood while listening to my favorite podcast. Just as long as I move for at least an hour each day, I’m happy and feel good about myself. As for what I eat, I really try not to deprive myself and yet focus on little tricks that will allow me to eat things that I love. Three things that I try to stick to every day are: 1) not eating past 8pm, 2) drinking a gallon of water throughout the day and 3) eating at least two servings of fruit and/or veggies. Following these three things are extremely doable for anybody and better yet, allows you to live a normal and social life. You’re not taking anything away from your diet, but rather adding to it which makes it a much more positive experience where you’re not punishing yourself. Furthermore, I save drinking alcohol for the weekends, which I know makes a huge difference when trying to live a healthier lifestyle. It’s because of these tricks that I’m able to allow myself to eat cookies, or order a side of french fries, or not worry about going out to restaurants because the food doesn’t work with my diet. I am in no way a lifestyle coach or health expert, but I really think that extreme dieting, intermittent fasting, or beating yourself up over a piece of chocolate isn’t going to work in the long run, and it usually doesn’t! Making small changes really does make an impact and you’ll have a better chance of not giving up once February hits. So. My point in all of this is that life is short and we deserve a doughnut from time to time, ok? And not just any doughnut but an insanely delicious maple bacon doughnut made from a yeasted dough and fried to golden perfection. We do not have to eat this every day, nor should we, but like all sweets, they should be enjoyed in moderation. I’m in the school of thought where if you’re going to have a sweet for dessert like ice cream, I’d rather reach for the full-fat stuff from Häagen Dazs or Breyers, have a scoop or two, versus eating an entire pint of the fake/healthy ice cream that’s been trending recently. I’d been wanting to make yeast doughnuts for the longest time since they’re my favorite type but was a bit hesitant because I figured that it would be too difficult and that I would mess up somewhere along the way. But I gotta say that making them was not only fairly easy, but actually a lot of fun and so worth it in the end! The doughnut recipe I’m giving you today is simply a standard yeast dough that yields a perfectly plain and barely sweetened doughnut that can be finished and glazed whichever way your heart desires. In the world of doughnuts, you’re either Team Cake Doughnut or Team Yeast Doughnut, and I definitely fall into the latter category. I like my doughnuts light and chewy, and these yeast doughnuts are exactly that. When it came to deciding what kind of doughnut flavor I wanted to make, I thought I’d be selfless this time around and make Alex’s #1 favorite, maple bacon. To put it simply, bacon is Alex’s love language (that’s right, there’s a sixth category that you can test into! ), and so whenever we visit an “artisanal” doughnut shop like Sidecar, Blue Star or Holy Donut (in Maine! ), Alex orders a maple bacon 100% of the time. A tip that I have to make the bacon suuuuuuper crispy is to chop it up with a sharp knife before cooking it on the stovetop. I had never thought to do this before and was really happy with the results, and plan on doing this in the future when I make homemade wedge salads or potato skins. Crispy bacon is vital to these doughnuts and should not be skipped! As for the maple glaze, you will be using not only pure maple syrup (the good stuff, ok?! ), but also a splash of imitation maple/maple extract, which can be found at your local grocery store. I normally wouldn’t use something like this, but it really does help give a lot of maple flavor and it makes the doughnuts smell so unbelievably good. A bottle of it will set you back about 3 bucks, so I say buy it the next time you’re out shopping. Let me know if you plan on making the doughnuts anytime soon! In a small bowl, combine the warm milk, yeast and 1 tbsp. of the granulated sugar. Stir together, and let sit until proofed, about 5 minutes. The mixture will be foamy with bubbles. Transfer the proofed yeast to the bowl of a stand mixer fitted with a hook attachment. Add the flour, vegetable oil. egg and salt, and mix on low speed for 4-6 minutes, or until the dough is shiny and has pulled away from the bowl. It will be fairly sticky. Remove the dough from the bowl and knead it by hand a couple of times on a lightly floured surface. Transfer the dough to a large bowl that has been coated with cooking spray, and tightly cover with plastic wrap. Allow the dough to rise at room temperature for at least one hour or until the dough has doubled in size. Once doubled, give the dough a small punch to remove some of the gas bubbles, then transfer it to a lightly floured surface. Roll the dough to 1/2” thick and, using a doughnut cutter (alternatively, you can use a 3 1/2” cutter with a 1” cutter for the holes), cut out as many doughnuts as you can. You will probably have to roll out the dough once more in order to use up all the dough. Move the doughnuts and doughnut holes to a lightly floured parchment lined sheet pan and allow to proof once again for about 1 hour, or until the doughnuts have doubled in size. Using a large pot or Dutch oven, heat about 3” worth of canola oil on medium heat until the oil reaches 325°F. Working in batches, fry 2 to 3 doughnuts at a time for about 4 minutes, flipping halfway through. The doughnuts will be a deep golden brown color. The doughnut holes will fry up in about 1-2 minutes. Transfer each finished doughnut and doughnut hole to a cooling rack (place paper towels underneath to catch any excess oil) and allow them to cool for about 10 minutes before glazing them. In a small bowl, whisk together the confectioners’ sugar, milk (start with 2 tbsp. and work from there to reach your desired consistency), maple syrup, and imitation maple. Dip each doughnut and doughnut hole into the glaze and immediately sprinkle with bacon bits. Enjoy! Doughnuts are best eaten ASAP, but can last a few days at room temperature. Just give them a quick reheat in the microwave to make them chewy again. I’ve been doing my best to ignore these non-ideal temperatures by partaking in events that are perfect for the season. Last week, my family and I did our annual night out at Universal Studio’s Halloween Horror Nights, where the whole theme park is turned into a haven for all things spooky and Halloween-related. And just this past Saturday, I went with a group of friends to the Hollywood Forever Cemetery via Cinespia to watch a screening of the original Halloween to celebrate it’s 40th anniversary. Although both of these days were pretty hot and dry (it reached 90° on Saturday), it still helped me get in the spirit. Of course, I’ve been taking this sentiment with me to the kitchen. The recipe(s) that I’m providing you with today are ones that define the season - I don’t think you can get more “autumn” than with apple cider doughnuts. These babies are a quintessential autumn treat that people go crazy for at apple picking farms, farmers markets, and of course, doughnut shops (like Sidecar and Blue Star - some local favorites of mine). Unlike the last time I posted a doughnut recipe, these will be fried in vegetable oil and therefore not baked in a doughnut pan. 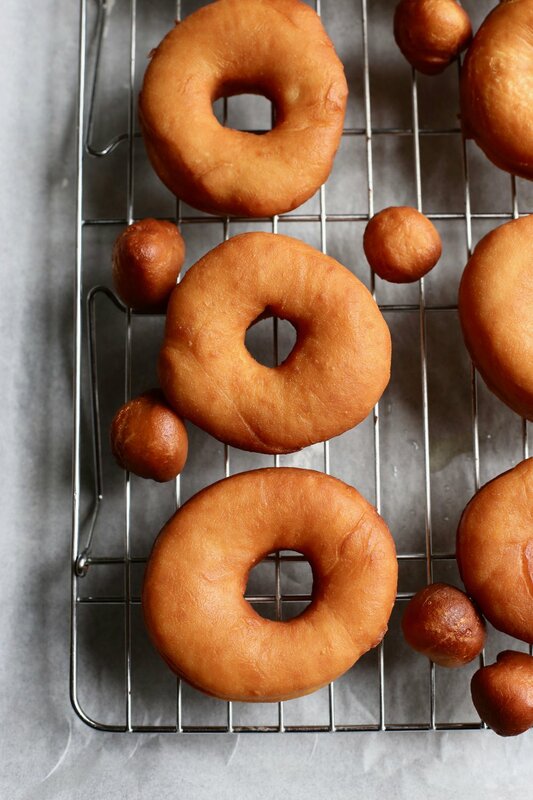 There will be a couple of things you’ll need in order to make a successful batch of these fried doughnuts: 1) a large pot or Dutch oven 2) a kitchen thermometer to keep on eye on the oil temperature and 3) a doughnut cutter. This is the doughnut cutter I used and it worked perfectly. The day I was frying up these apple cider doughnuts was unfortunately a pretty hot day but I didn’t mind due to the amazing smells it gave my apartment. Although I didn’t have to put a sweater and socks on, I was hugged by the warm spices that define the season (cinnamon, nutmeg, and cloves) and that at least made me feel like it was a proper autumn day. Besides giving you a recipe for the doughnuts, I’m also including a recipe for apple butter, which is actually one of the ingredients listed for the doughnuts. You of course have the option to buy store-bought apple butter to save time, but I definitely think making your own apple butter is worth it and will feel like such an accomplishment. Although it is a bit time consuming (the apple butter cooks in the oven for about 3 hours), it is fairly a hands-off process with the most tedious step being to peel the apples. My best advice would be to treat this entire post (apple butter and doughnuts) as a weekend project: make the apple butter early on a Saturday, followed by making the doughnut dough and allowing it to chill in the fridge overnight, and finally frying off the doughnuts on Sunday morning for breakfast. That way, it’s not all too overwhelming and allows you to enjoy each process. The apple butter recipe yields about 2 cups and since you only need half a cup of it for the doughnuts, you luckily are left with a good amount to enjoy in other ways. Not only can you gift a jar of it to a friend or family member, which they would LOVE, but you can also choose to be selfish and keep it for yourself to spread on toast, waffles, scones, etc. I say to go with the latter option, but hey, I’m only recommending it because you deserve it after all the work you put in it! Unlike in apple pies or other fruit desserts where there are specific “baking apples” to use, the apples that work best for apple butter are ones that have a softer skin. These varieties include Fuji, Gala, Braeburn, Honey Delicious, and McIntosh. Feel free to mix and match - I did a mix of Gala and Fuji. In a large skillet, bring the apple cider and cinnamon sticks to a boil over medium-high heat and cook until the liquid reduces to a thick and syrup-y consistency, about 20-30 minutes. There should be about a 1/3 cup of liquid when finished. Scrape into a medium bowl, and whisk in the apple butter, buttermilk, and vanilla extract. Set aside. In another medium bowl, whisk the flour, baking powder, 1 tsp. of cinnamon, nutmeg, cloves, and salt. Set aside. Using a stand mixer fitted with a paddle attachment, or in a bowl large enough for a hand mixer, beat the butter, brown sugar, and granulated sugar on medium-high speed until light and fluffy, about 3-4 minutes. Add the eggs one a time, making sure to mix well before adding each one. With the mixer on low, add in half of the dry ingredients, then half of the wet ingredients. Repeat once more, and mix until well incorporated. The dough will be very sticky. Transfer the dough to a parchment paper-lined baking sheet that is generously dusted with flour (use about 1/3 cup). Sprinkle more flour on top of the dough, and with floured hands, gently press out the dough until it is 3/4” thick. Dust once again with flour. Tightly wrap the baking sheet with plastic wrap and chill in the fridge for at least 3 hours, or overnight. Whisk the cinnamon and granulated sugar in a bowl (this will be for the doughnut topping). Set aside. 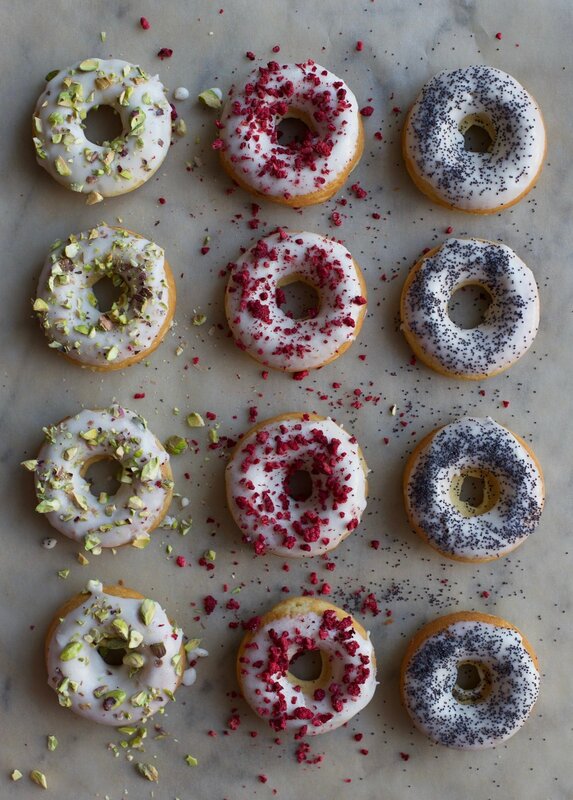 Take the baking sheet out of the fridge, and begin punching out doughnuts using a doughnut cutter. After first batch, gather the scraps and re-roll the dough out gently and punch out more doughnuts. Repeat until you have 16 to 18 doughnuts and doughnut holes. Using a Dutch oven or large pot, heat about 3 inches worth of vegetable oil on medium-high heat until the oil reaches 350 degrees F (you’ll need a kitchen thermometer for this). Working in batches, fry about 3 to 4 doughnuts at a time for 2-3 minutes per side, until they’ve reached a deep golden brown. Once all doughnuts are done, fry the doughnut holes for about 1-2 minutes per side. Transfer each finished doughnut and doughnut hole to a cooling rack (place paper towels underneath to catch any excess oil), allow them to cool for a few minutes, then toss into the cinnamon-sugar mixture while the doughnuts are still warm. Enjoy! Doughnuts are always best when eaten the day they are made, but are okay the 1-2 days after when stored in an airtight container at room temperature. In a Dutch oven or large ovenproof pot, combine the apples, apple cider, brown sugar, and salt and cook on the stovetop over medium heat. Bring the mixture to a simmer, partially cover with the lid, and cook for about 15 to 20 minutes, or until the apples are soft. Removed from heat, and stir in the lemon juice, vanilla extract, and spices. Preheat the oven to 250°F. Using an immersion blender (or you can carefully transfer the cooked apples to a blender and work in batches), puree the apples until smooth. Place the Dutch oven or pot into the oven, lid removed, and bake for 2.5 to 3.5 hours, stirring every 30 minutes, or until the apple butter is a deep amber color. The time it takes depends on what kind of apples you use. Allow the apple butter to cool completely before transferring to an airtight container. Store in the refrigerator. Enjoy on toast, scones, waffles, etc. and/or use for the doughnut recipe above! I have a pretty funny relationship with doughnuts. Growing up, my mom would have these huge garage sales (we're talking hundreds of clothes for sale) and my sister, Tianna, and I would have to get up at the crack of dawn to help my mom put up signs around the neighborhood and drag everything from the garage to the driveway. My sister and I absolutely hated doing it, and so the only way my mom could get us to help was by treating us early on with a box of doughnuts from Yum Yum Donuts or Winchell's. Tianna and I were pretty lazy kids, but when food was promised we happily obliged (somewhat). This association of doughnuts with garage sales has remained in my mind ever since and so I never really crave doughnuts unless for *special morning occasions* - getting up early for flea market excursions or before long road trips. I honestly beg my mom all the time to have garage sales solely for the excuse to eat a box of doughnuts. Yes, I know I can go buy a box of doughnuts whenever I please but it just wouldn't be the same! My favorite kind of doughnut has been and always will be a Long John, the yeast risen unfilled doughnut bar with chocolate icing. With that said, I have never attempted to re-create Long Johns at home, or any fried doughnuts for that matter. I guess I've just been a little scared of the hot oil and making a greasy mess in my kitchen. Best to leave the frying to the professionals (for now!). But when it comes to baking doughnuts, I have no problem whipping up a batch whenever Alex has a hankering for a slightly healthier version of doughnuts. What makes baking doughnuts so much easier than frying is 100% due to the invention of the doughnut pan, With this amazing contraption, you don't have to worry about cutting out perfect circles or deal with removing the centers; the hard work is done for you. I will say that baked doughnuts do taste very different than fried doughnuts in the sense that they taste more like cake, but listen to me when I say that they are still very delicious and will satiate your doughnut cravings. I've made a variety of baked doughnut over the years and one of my favorites was a lemon poppyseed recipe. This time around I decided to simply do a lemon doughnut with a lemon glaze and leave it up to the baker on which topping to add: pistachios, freeze dried raspberries (strawberries will work as well), or poppyseed. All three of these toppings compliment lemon very well and give nice texture to the light and cakey pastries. Feel free to mix it up and use multiple toppings (pistachios and freeze dried raspberries look gorgeous together). Preheat oven to 375°F. Spray doughnuts pan(s) with nonstick cooking spray. In a large bowl, whisk together the flour, baking soda, baking powder and salt. In a measuring cup, combine milk, buttermilk, and lemon juice. In the bowl of a stand mixer fitted with a paddle attachment (or in a large bowl that you will use with your hand mixer), mix sugar and lemon zest by hand until combined and very fragrant. Add the butter and beat on medium-low speed until light and fluffy, about 3 minutes. Add the egg and vanilla extract and mix again for about 1 minute. Scrape down the sides of the bowl. With the stand mixer on low speed, alternate between adding the flour mixture and liquid mixture to the stand mixer bowl in 3 additions, starting and ending with the flour. Mix until well combined. Spoon the batter (it will be pretty thick) into a large Ziploc bag. Cut off one of the bottom corners of the bag and pipe the batter into the doughnut cavities, filling no more than 2/3 of the pan. This step is crucial because if you just use a spoon to fill the cavities, the doughnuts will come out of the oven looking lumpy! Use this video for guidance on how to pipe with a Ziploc bag. Bake in the oven for about 10 minutes, rotating halfway through, until the edges are lightly brown. Continue filling doughnut cavities and baking until all batter is used up. Let the doughnuts cool in the pan for a couple of minutes before transferring to a wire rack lined with parchment paper. Allow doughnuts to cool while making the glaze. Make the glaze: in a large bowl, whisk all glaze ingredients together. For a thicker glaze, use 2-3 tbsp. of milk (this is what I did); add 1-2 tbsp. for a thinner glaze. Dip one side of the doughnut into the glaze and immediately top with either chopped pistachios, freeze dried raspberries, or poppyseed.